WHY DIESELS SMOKE: Diesel car engines get smoky because of a few common reasons. Identifying the smoky colours, often black or white smoke, can help you diagnose the cause of the problem. That in turn can help you cure and stop a smoking diesel engine. Do you see white smoke from a diesel engine when accelerating or startup? If so, that can help you determine which parts are failing inside your smoky diesel engine. Is your diesel engine running OK, but kicking out excessive plumes of black, white, or blue smog? There is a lot to learn from the colour and characteristics of foggy emissions blowing from your car or truck. Some common symptoms of 'blow-by' and 'oil usage' can also help you find out why you have a smoky diesel engine. That will let you know which components need most attention. It would be a visible sign that your automobile is not running well. The level of pollutant emissions may not be functioning as they should. In the most severe cases you may need some expert advice or help from a qualified mechanic. Black smoke from a diesel engine when accelerating is not always a serious problem. Most diesel cars (if not all) emit a small amount of black exhaust smoke while accelerating. It takes some time for the engine system to develop enough revolutions (RPM) and power to burn the fuel. This is how a diesel engine works and they are not the typical signs of a smoky diesel engine. But, what if there is a noticeable excess of coloured exhaust smoke bellowing out behind your car during acceleration? This introductory guide to smoking and smokey diesels will show you how to reduce black smoke from diesel engines. What Makes a Car Smoke out of the Exhaust? You can keep a modern diesel car in good condition with regular tune-ups and maintenance. In this case, it should produce very little visible smoke from the exhaust. This is true for the operating conditions of most diesels. Diesel engine smoke problems materialize for varying reasons. But most drivers accept there may be evidence of short puffs of gray smoky haze or vapour when the engine is accelerating hard or under heavy load. Heavy duty diesels and most trucks emit some white or black smoke on startup or accelerating. It is often a result of bad driving technique (lugging), poor injector maintenance, or excessive fuel delivery rates. It may also be a combination of all three. Gray, black, or white smoke emissions are warning signs. The vehicle is either wasting diesel fuel or burning it inefficiently. In these cases some level of engine damage is occurring or it is deteriorating. The most prudent solution is to conduct routine servicing. That helps to reduce many problems that cause smoke emissions. In the long term it is most likely to save you time and expense. Even so, as most diesel car owners know, mechanical problems can and do occur. This is true even after regular vehicle servicing and with new or top of the range 4x4 and SUV models. Let's troubleshoot the reasons for a smoky diesel engine. Always make an initial inspection for a clogged air filter. A common reason for vehicle smog is insufficient air getting drawn or sucked into the system. The cause is often something as simple as dirt or grime clogging the filtration system. A clogged air filter does not allow the diesel to burn how it should. This would be one of the first things we recommend to do when checking for causes of smoky engines. Even the most untrained mechanics will find it easy to check the air filter for dirt. Remove the filter from its casing and rev up the engine. Revving the engine without the filter will not do any harm for a short period of time. If the engine still smokes, then the diagnosis is that something else is causing the problem. You might be a little disappointed if the problem persists after checking the filter. Renewing the air filter is an easy part to replace and one of the cheapest repair solutions. You may need a competent diesel fitter for further inspection. The next area to check is the injectors. Having a dodgy injector suggests a low burn quality of the diesel and often produces black smoke. Poor engine timing also causes black smoke. Any general inefficiency of the system results in unburned fuel. That means you are likely to see smoke-filled blackened plumes blowing out of the exhaust. Note: It is possible to fix the injectors or the engine timing yourself. But, at this stage our advice is to get professional help to stop black smoke from a diesel engine. What is black smoke from a diesel engine? When things go wrong, diesel cars can produce unburnt black soot emitted from the exhaust. It is actually an imbalance in the air to fuel ratio. Diesel particulate matter, consisting of carbon compounds, have not burned as they should. The common reason for this incomplete combustion failure is low local temperatures. This can create situations where fuel is not fully atomized. Another cause of black smoke from the exhaust could be when your engine is burning too much fuel. Check the vehicle's intake components. Start with the air filter, fuel injectors, sensors, and the fuel-pressure regulator. Although it is less common, a clogged fuel line may also produce similar symptoms. The least amount of damage occurs if you replace worn or damaged components once you have identified the problem. A good tip for diesel owners is to keep on top of engine tune issues. This includes regular servicing of air, fuel, oil filters, and setting up valve adjustments. Black diesel engine smoke when starting on cold start, or while accelerating hard, is not uncommon with older cars. But buying fuel from disreputable outlets is almost certain to cause you problems at some stage. Using dirty diesel fuel produces murky components. Always clean your injectors with an effective and reliable fuel system cleaner. Sooty black or grey smoke is not a good sign if your vehicle is a late model car (or truck) with a 'clean diesel' engine. Modern diesels get fitted with electronic controls and high pressure common rail injectors. This also helps to reduce smoking diesel engine problems. Wear in the power assemblies such as cylinders, piston rings, ring grooves. Worn valve guides or seals. Piston rings may be sticking. An incorrect grade of oil (e.g. too thin, migrating past the piston rings). A problem with cylinder glaze. Fuel dilution in the oil (oil thinned out with diesel). Fouling deposits around the piston rings. Cylinder glaze (Carbon got deposited in the machined cylinder crosshatching). In simple car terms, blue smoke suggests you need to restore physical cleanliness to all the engine components. You should also replace any worn mechanical parts. A major overhaul will involve taking the engine apart. Before you attempt such a drastic repair you could try freeing up the cylinder rings with a can of Wynn's. Wynn Oil Treatment helps to stop excessive oil consumption. It can also restore engine compression and increase oil pressure. What does it mean when your car emits white smoke? As a rule, this would be a sign of an internal leak and the engine is burning coolant or transmission fluid. There are two common reasons for a diesel to produce smoky white coloured clouds from coolant leaks. 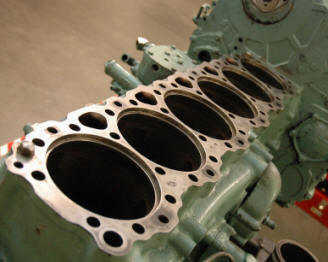 A cracked cylinder head (block). What if the problem is transmission fluid? The engine could be sucking transmission fluid through one of the vacuum hoses that connects to the transmission. White smoke is usually 'steam' which means water is vaporizing. If it is smoking white, it could be as a result of low engine temperature. It would usually smell of unburned diesel (whereas white steam would not). If water is entering the combustion spaces, it 'boils' and results in white smoke. Water entry is most often caused by a faulty or blown head gasket and sometimes a cracked cylinder head. Check for faulty or damaged injectors or incorrect injection timing. Worn timing gear or damaged crankshaft keyway could also be the cause. Low cylinder compression is often caused by leaking or broken valves, sticking or worn piston rings, or cylinder wear. White smoke occurring on a diesel engine at cold start is not too uncommon on cold frosty morning. Continuous smoke-filled white clouds while driving could also be a sign that fouling deposits are developing around the piston rings. Or there could be some cylinder glazing (especially if it disappears when the engine warms up). What if the smokiness persists after the engine has warmed up? The problem may be a faulty injector, failure in the fuel pump, or timing problems (usual cause). Although rare, air in the fuel system can also cause the same problem. A diesel mechanic knows how diesel engines work and he can test the engine compressions. Worn cylinders means there may not be enough compression for complete burning of the diesel fuel. It may also be as a result of worn valves or valve guides. In this case you are likely to see smoke puffing out of the engine crankcase breather pipe. Note: Steam caused by a leaky head gasket or other water leak into the combustion system can disguise itself as smoke. Steam will dissipate rapidly once it hits lower temperatures than ambient air. Whereas smoke, all things being equal, will persistently blow and hang around in the air. The free-acceleration test (vehicle stationary) is commonly used to test for exhaust smoke. But because it does not simulate the typical conditions which exist when the vehicle is under load, you may find the results inadequate. It can also be difficult for the driver to observe any evidence of exhaust smoke from inside the cab. Thus, carry out observations from behind and while the vehicle is being driven on the road. It is best performed under varying conditions of load and driving speeds. The vehicle should be traveling at normal operating temperature during the test from a cold start (unless you suspect a faulty choke). It should be road-tested at regular intervals and after mechanical servicing. We hope this guide helps to sort out your smoky - or smoking - diesel engine. Disclaimer: Technical data about smoky diesel engines is for general informational purposes only. The advice and opinions given are not intended to be a full diagnostic guide and should not get used as such. We use reasonable efforts to ensure that information herein is accurate and up to date. But we make no warranties or representations on the accuracy of the content and assume no liability or responsibility for any errors or omissions. We also have a recommendation for carrying out any diagnostic work, servicing, car repairs, or other work to smoking diesel engines. It should get carried out by a trained and competent mechanic who is knowledgeable in diesel engine workings.